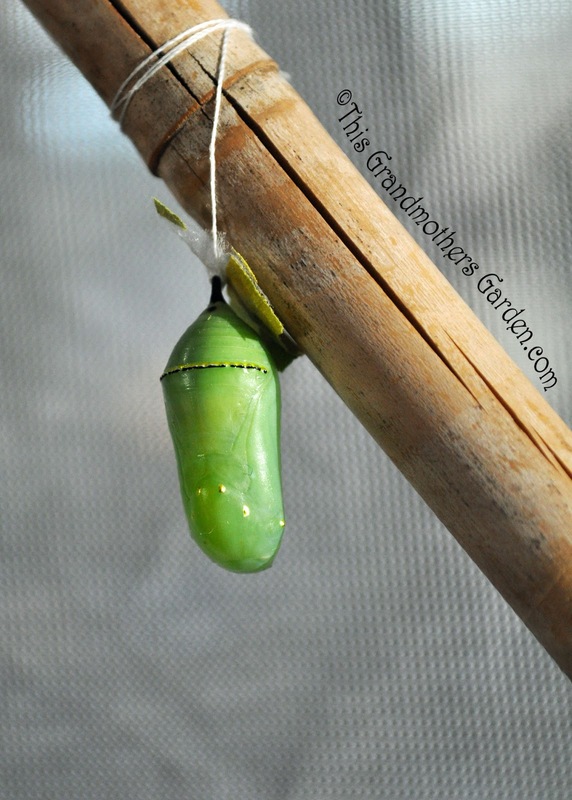 This Grandmother's Garden: Butterfly Dreams Part Three... Chrysalis! Changes are happening rather quickly in our Butterfly Dreams! 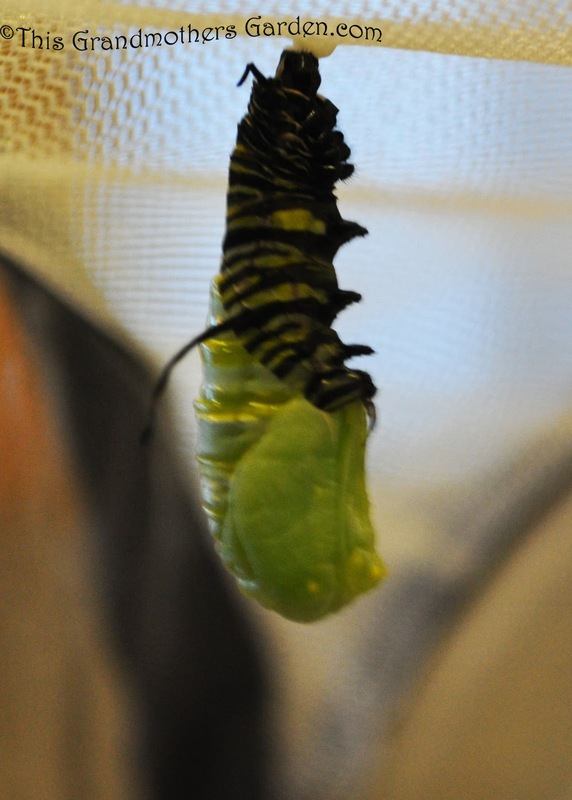 Our caterpillars are transforming into Chrysalis. 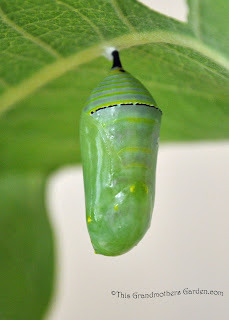 Monarch Caterpillars in the wild will move away from their food source to begin this transformation into a Chrysalis. 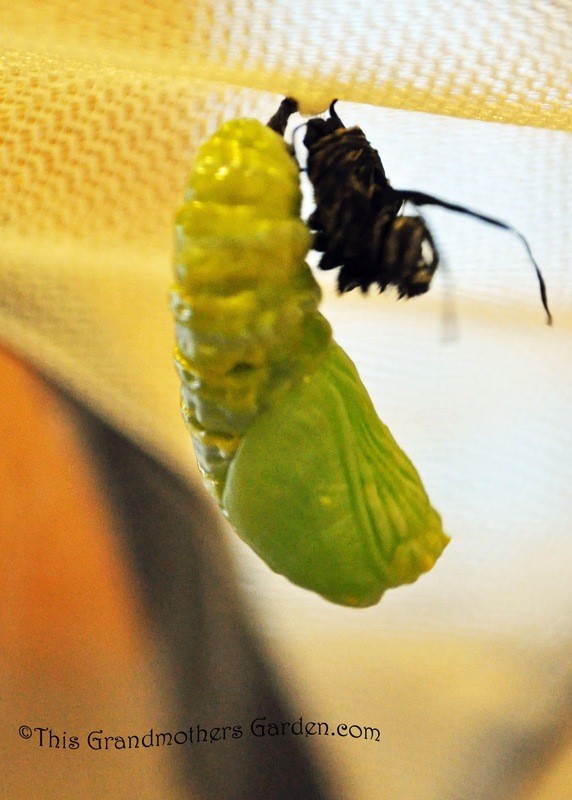 Even though we provided sticks for our caterpillars to climb on, several chose to spin their little white button of silk to the underside of a leaf. who may realize this leaf will make a tasty meal. But at this stage of the transformation, it's too late to encourage the little guy to go elsewhere. If we wait patiently for a few days, it will be easy and safe to move him. And look at what's inside! as the change took place. This all happens within a minute or two. more subtle changes take place until all appears to be still. and the transformation will be complete in 8-12 days. 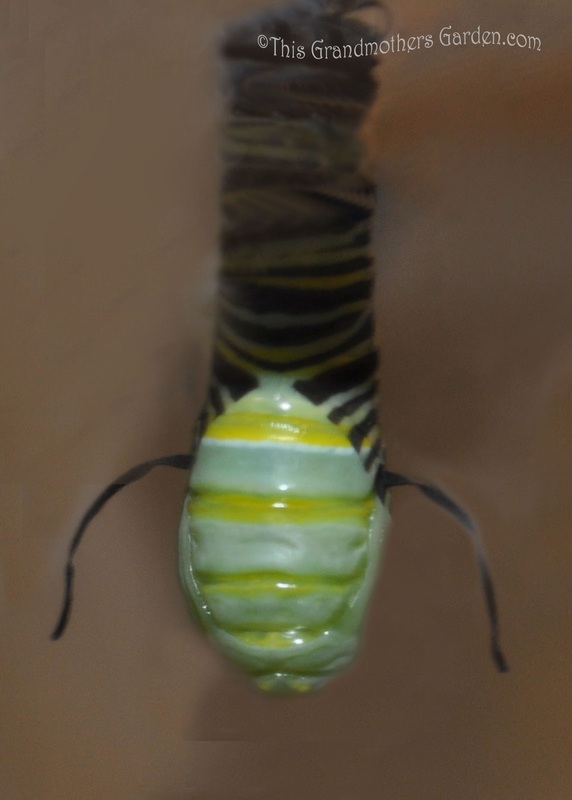 Our first Chrysalis is still in a dangerous place. Can you see the danger? Already those leaves are beginning to disappear. And that isn't all the danger. After a couple of days, the leaf is beginning to dry. The branch this leaf is on is in a vase of water and after three days must be discarded and replaced with a fresh branch of milkweed. 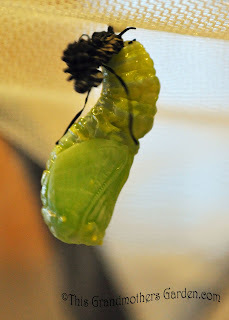 Not good for a Chrysalis that needs peace and quiet for 8-12 days. 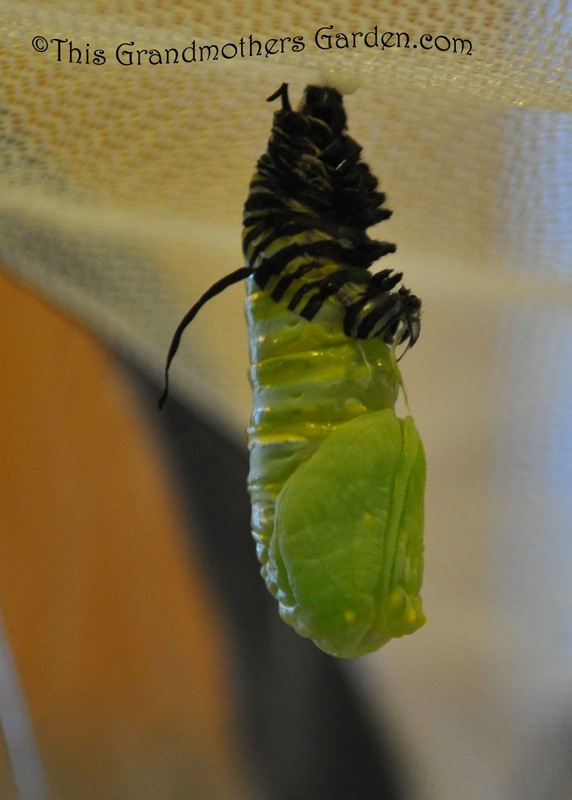 We left the new chrysalis undisturbed for 2-3 days, then we carefully tied a piece of thread to the black stem of the Chrysalis and cut it away from the leaf it was attached to. Then we tied the thread to the stick. And now we wait for the butterfly to emerge. We'll see you in our NEXT post! Carolyn, an amazing sequence of photographs, I'm already looking forwards to the follow up post! Thanks for sharing. I had to back up as I'd missed your previous caterpillar posts! This is so exciting! I would love to do this someday, but have been struggling a little to get some of our native milkweeds to grow and be happy here. This will just make me more determined to get them to grow. Can't wait for the next chapter! I looked at these photos over and over in amazement. I've never seen this happening. I'm so glad you helped the poor guy out with his hanging home! This is such an amazing process and I would be glued to watching them like I was watching a good TV program. I bet you are still tickled pink that your son brought these home to you. You have some really nice photos of the transformation. I'm so glad you're enjoying my Butterfly Dreams... it truly is a dream come true for me and Donna, you're so right about it being just like a good TV show. We've pretty much been glued to our seats as we've watch them. The Caterpillars are all Chrysalis now so there isn't much action going on, but we still sit and gaze at them whenever we walk by. Number two Butterfly emerged this morning and number three will emerge tomorrow morning. We are sooo excited! 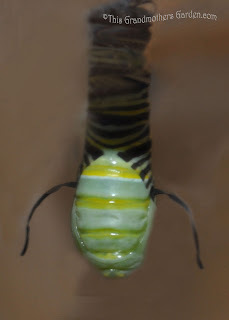 I've never seen a monarch caterpillar before. Very engaging series of photos. 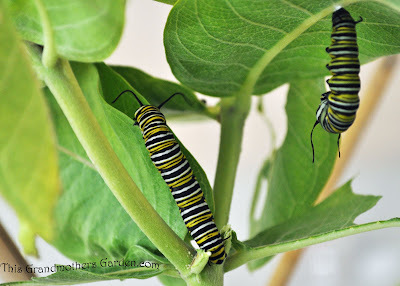 The caterpillars have their own symmetrical beauty to them. Your pictures of monarch chrysalis transformation is amazing - thanks for sharing. Your photos are awesome! Love how you present this lesson! This is one of the best posts I have seen in a long time. 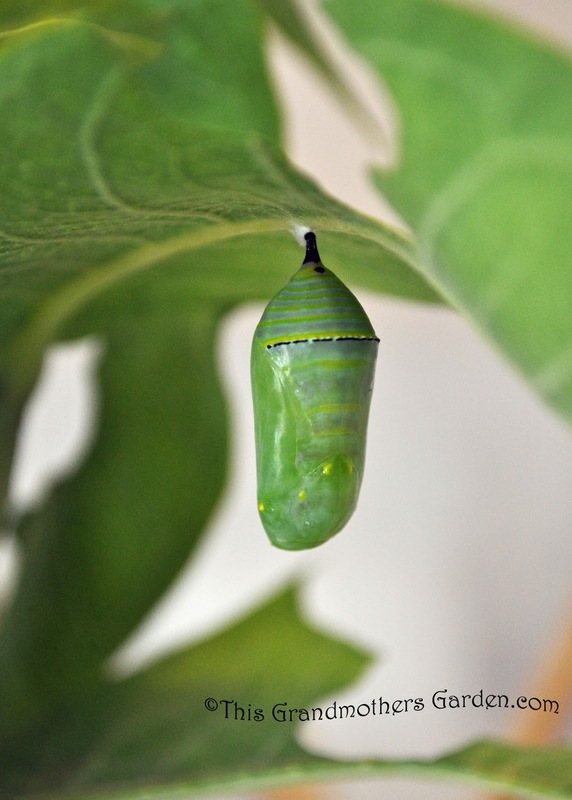 Thank you for sharing the transformation you witnessed. A small miracle. 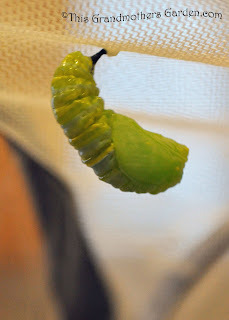 While the metamorphosis is amazing in itself, your photos are so wonderful. 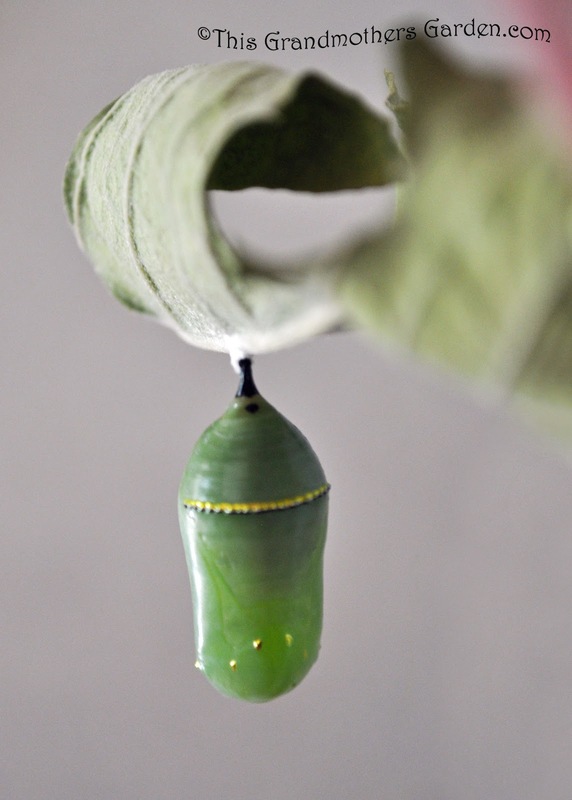 What will you do with them when they emerge? Won't it be the middle of the winter? Can't wait for Part III. And thank you for your faithful following of The Garden Spot. I have far less exciting adventures to write about. 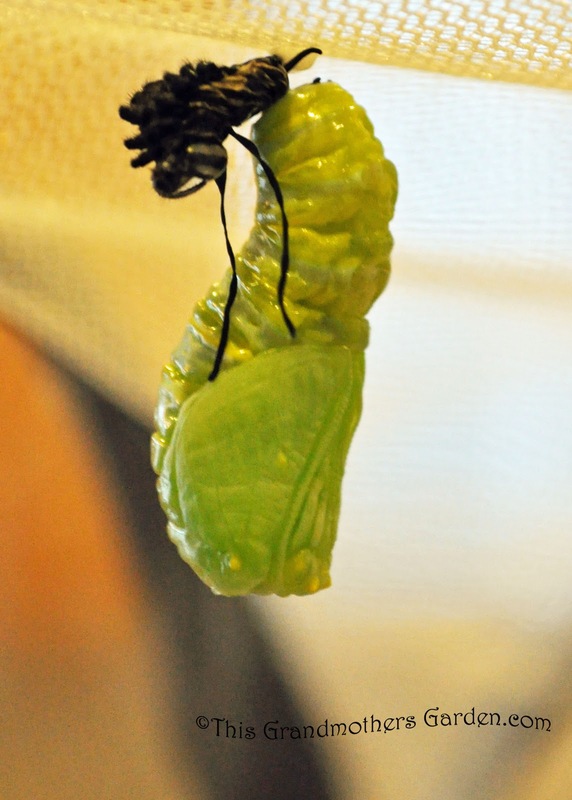 8-12 days of becoming a Chrysalis. We keep them until the following morning, then we set them free. Two are now on their way to Mexico and one will leave tomorrow. 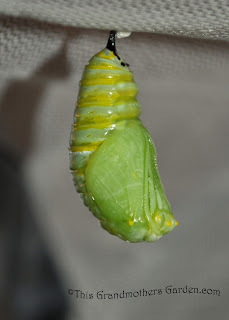 Three still in Chrysalis. Our marvelous journey with them will soon be over... it has been so amazing. 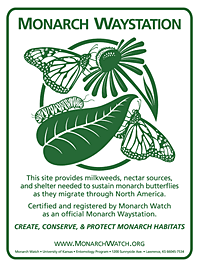 Monarchs are my exception too. They are beautiful. Thank you all for your sweet comments. Love them all! 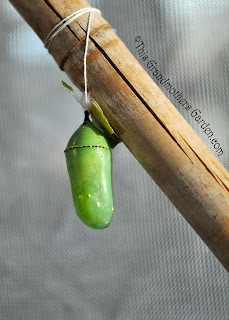 Ingenious save for that chrysalis...I have found my common milkweed chewed but no sign of the caterpillars or chrysalis...Maybe they are there but I have not had time to really look...this wonderful series of posts is so informative and wonderfully spiritual..thx Carolyn!! 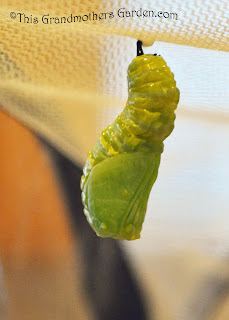 I love seeing a closeup of this metamorphosis! Awesome. Thanks for sharing! 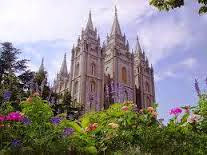 It's an amazing process, and a beautiful one. Love that you got creative with the dying leaf. Hello again, I am back. It is amazing what nature do. And it was so nice that you give a better place for that small miracle. what a lovely sequence of photos you have there Carolyn. since you have it on a stick it will be easy to watch as the butterfly emerges. I look forward to the next installment. Wow, well done with the sequence. I can only imagine how you achieved it. Looking forward to more. It is such an amazing and beautiful process - and your wonderful photos document it so well! A monarch passed through my garden yesterday - on its way to Mexico I assume. 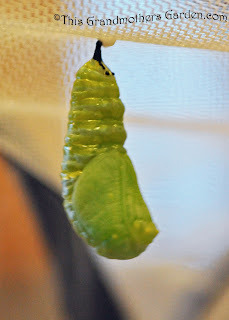 Everybody seems to be posting all their butterfly transformations, which i always love to do but still hasn't for i am not yet able to stay at home and tend to them. Office employees shouldn't dream of shooting this process as just yet. 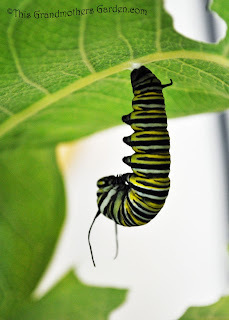 You should see Carol's of Flower Hill Farm, she also posted this and the swallowtail, lovely photos too. Another in Singapore Butterfly Farm posted the time lapse video which is really fantastic. I envy you people. I promise I will do that too! I feel envious, maybe your climate is really conducive to most crops, not too dry-not too cold. I am not gardening as i dont have time, but my mother does. Even the very easy vegetables like okra, stringbeans, squash that my mother planted have pests and diseases. Even the healthy-looking taro now has some fungus which destroyed the leaves. Okra had been feasted on by some larvae which rolled itself at the folded edges. Squash succumbed into virus, so i got the tops and made vegies out of it. 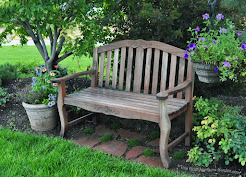 Maybe if i can be fulltime, i can garden also as nicely as yours, oh when will that be is the big question. It is such an amazing transformation isn't it! Nature is truly amazing isn't it? I've never actually witnessed the transformation so I enjoyed your post chronicling it!